googleVis 0.3.0/0.3.1 is released: It's faster! 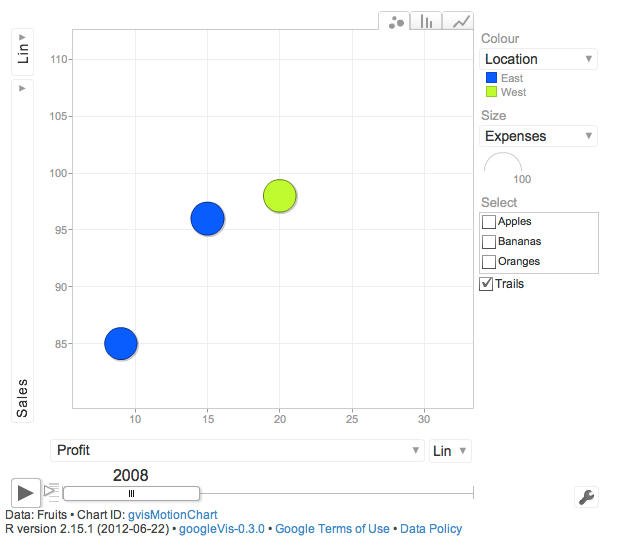 Version 0.3.0 of the googleVis package for R has been released on CRAN on 20 October 2012. With this version we have been able to speed up the code considerably. The transformation of R data frames into JSON works significantly faster. The execution of the gvisMotionChart function in the World Bank demo is over 35 times faster. Thanks to ideas by Wei Luo and in particular to Sebastian Kranz for providing the code. Further, the plot function plot.gvis has gained a new argument ‘browser’. This argument is passed on to the function browseURL. The ‘browser’ argument is by default set to the output of getOption(“browser”) in an interactive session, otherwise to ‘false’. This prevents R CMD CHECK trying to open browser windows during the package checking process. Unfortunately this caused an error message under RStudio and RGui on Windows. The argument has been removed again and plot.gvis handles the check if R is running interactively internally. The bug has been fixed in googleVis-0.3.1, not yet available on CRAN, but on our project download page. Thanks to Henrik Bengtsson and Sebastian Kranz for their comments, suggestions and quick response. Should you find any further issues or bugs with the new version, then please drop me a line or add them to our issues list. The defaults of those new arguments are set to “”, which means gvisMotionChart will assume the columns in order of your data frame. This is the same behaviour as in the previous versions of googleVis. Thanks to feedback from Erik Bülow the mechanism to load the Google API is now handeled via a secure https-connection rather than http.